Twenty years ago, individuals preparing for retirement could rely on traditional fixed interest options like U.S. Treasuries and Corporate Bonds to provide reliable growth and income. As you prepare for retirement today you may not be satisfied with current low interest rates and you may be looking for an alternative. 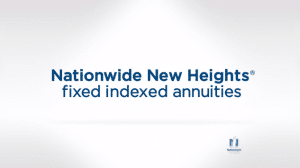 Nationwide New Heights Fixed Index Annuities can help you grow and protect your retirement savings. Nationwide New Heights provides principal protection for the money you’ve worked so hard to earn and a growth opportunity based on the performance of an underlying index, including the J.P. Morgan MOZAIC Index, a new opportunity for growth, designed to provide consistent positive returns in a variety of market environments. 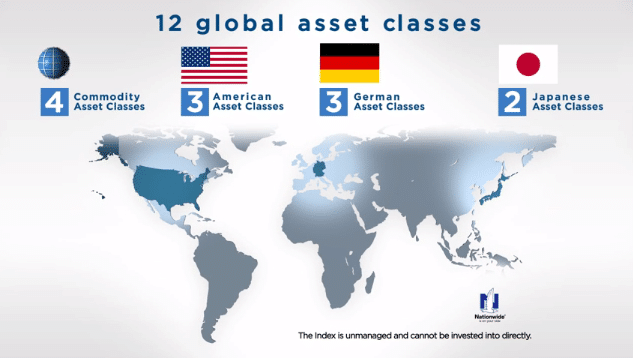 With access to 12 global asset classes, the J.P. Morgan MOZAIC Index includes equities and fixed income from the United States, Germany, and Japan, three of the world’s most established markets, and four global commodity asset classes to provide even broader diversification. First, the index evaluates each of the 12 asset classes based on their six month performance. Second, the index selects up to six asset classes with the greatest positive returns over the prior six months. Third, the asset classes are strategically weighted to provide a more stable return. This process repeats each month to take advantage of changing market conditions. This monthly rebalancing process has resulted in consistent stable returns year after year. From 1999 to 2014 the S&P 500 Price Index has averaged a 3.28% annual return, while the J.P. Morgan MOZAIC Index would have experienced a 5.53% annual return. This equates to a 69% higher return while experiencing 79% less volatility, as shown by the green line steady growth, without any large drops. Looking closer at the year end returns for the J.P. Morgan MOZAIC Index, it would have provided positive returns every year, while the S&P 500 Price Index experienced two bear markets during this 16 year period from 2000 to 2002 and again in 2008. During both bear markets the S&P 500 Price Index suffered severe losses, each of which took years to reach the same level as before the market correction, and the J.P. Morgan MOZAIC Index would have continued to provide positive returns. Ask your financial professional how Nationwide New Heights and the J.P. Morgan MOZAIC Index can help you face retirement with confidence. If you would like to learn more, please call us at +1 (972) 473-4700 or schedule an appointment today.